Mobile Filmmaking news from S. Botello Productions™ concerning our programs, events & community. We will occasionally share updates and other important news affecting the mobile film & video community in general. Q&A Panel during MFF2017SanDiego. April 30, 2017. Left to right: Javier Augusto Nunez, Brian Hennings, Aris Tyros, Claudinho Andrés Gómez, Mickey Harrison, Anthony De La Cruz, Miranda Mullings & Richard Tews. Photo by Hall H Show. MFF2017SanDiego was a celebration of smartphone mobile filmmakers from around the world which took place in San Diego. As is tradition, the sixth annual International Mobile Film Festival took place during the last weekend of April. This year, our venue was the Marina Village Conference Center, close to the famous landmark Sea World. The filmmakers came from Australia, Chile, Germany & Canada. This year, we included a few from San Diego. The best place in the world with the coolest people in the world can be found at Comic-Con. If you play Pokemon Go this place was lit up and people were scoring big time! Aside from Pokemon Go, there is magic at this event. 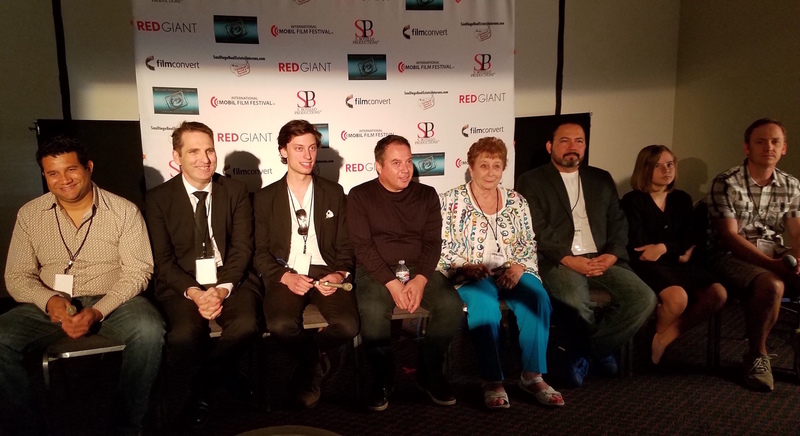 Our 5th Year Anniversary of the International Mobil Film Festival™ by S. Botello Productions™ took place in San Diego's Pyramid Innovation Center on the weekend of April 30 & May 1, 2016. The event venue was sponsored by David Menna's WealthWave in cooperation with Jennifer Meim Productions. Other sponsors included Red Giant software, LuLu Films, Passage Productions and SanDiegoRealEstateVeterans.com.